Even though it is easy to communicate in Poland using English only, as a turysta travelling to Poland, you might find some of these words useful. Let’s start with the airport (lotnisko or port lotniczy). For your departure go to odloty. That word also has a different meaning so you might be surprised with some of the content google will come up with when you type it in, it has something to do with Polish girls of course. Leave a comment if you are still curious, it might be connected with vacation but not travel. Odlot can be a word for something unusual and astonishing as well as being high. After your odprawa (check in ), plural from odprawy, or nadanie bagażu (this one refers to your baggage specifically) , you can proceed to your bramka (gate). After your flight (lot) and claiming your luggage (odbiór bagażu) go to wyjście, which is an exit. Unless you have something to duty (cło), of course. Wyjście is only for walking situations, so if you are driving and intend to exit the highway, look for wyjazd instead. When you come to the airport to pick someone up, you go to przyloty. This one does not have any hidden meanings. Parking , taxi and shuttle are the same as in English. 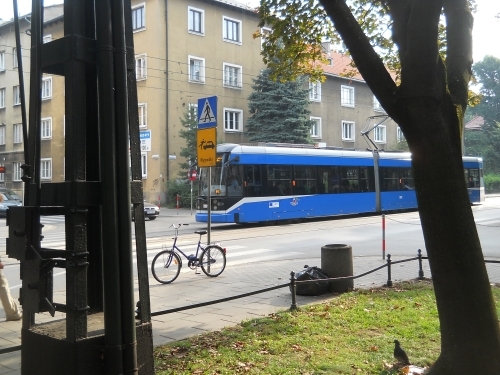 Trolly or 'tram', bike or 'rower' or on foot or 'na nogach' or 'pieszo' in Polish. Look at this picture you can see all those three things and flying is for the birds. If you are travelling by train, you need to go to dworzec kolejowy. Buy your tickets (bilety) at kasa and then find your peron (platform). Polish trains are often late, so make sure you check the timetable (rozkład). Bus station is quite similar- it is called dworzec autobusowy, you can buy tickets at kasa as well, but a lot of times you just buy it from the driver after you get on the bus or coach. They usually leave off of a stanowisko. Some extra things you may need include kantor (exchange), WC (pronounced vu-tze) – restroom and opłata (cost, charge) or cena (same meaning). Once you know all these, you should not have any problems communicating while you travel to Poland, even if you come across someone who does not understand English.